Underneath the now-obligatory camouflage lies the lighter, stiffer, harder and more powerful Audi R8. The new Audi R8. The second generation of Audi’s two-seater, mid-engined supercar. So is this the ‘difficult’ second album then? It would appear so, wouldn’t it? After all, it was almost universally acknowledged that Audi’s first-ever attempt at the supercar game in the first generation R8 was a massive success. Over its eight-year life cycle, some 25,000 R8 models were sold globally. Compare that to Lamborghini’s Gallardo, which sold 14,000 models over ten years, and you’ll see how popular the first R8 was. So what’s new about this car then? Underneath, pretty much everything is new, or has been revised and spruced. Let’s start with the chassis, which was developed in tandem with Audi AG, Quattro GmbH and Lamborghini, a crack team of around 80 engineers creating a new platform that would run across new R8 and new Huracan. Once this platform was laid down, both Audi and Lamborghini went their separate ways (Audi’s R8 is a little longer than the Huracan, mind – some 3cm in the wheelbase). 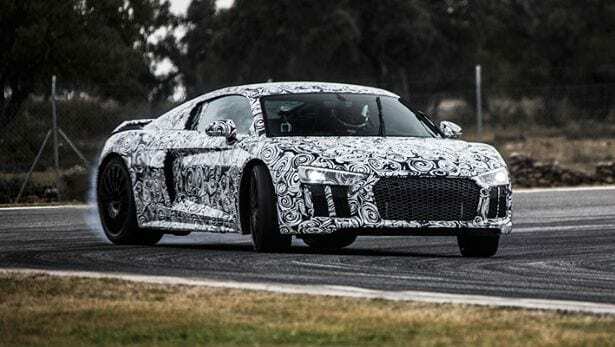 The new R8 is wider and 40 per cent stiffer than its predecessor, is built from materials including aluminium and carbon fibre, sits 30mm lower than before, weighs just under 1500kg (dry), and features four-wheel-drive, a double-clutch gearbox and a V10 engine. How powerful is that V10? The R8 will launch in two versions: a 532bhp V10 with 399lb ft of torque, or 602bhp, Huracan-baiting ‘V10 Plus’, together with 412lb ft of torque. The 532bhp version will accelerate from 0-62mph in 3.5 seconds, 0-124mph in 11.3s and top out at 200mph. The V10 Plus? 0-62mph in 3.2s, 0-124mph in 9.9s and a 206mph top speed. Neither, you’ll see, is found wanting for sheer speed. They’ll both be matched to Audi’s ‘S-Tronic’ tranmission – there’s no manual offering yet, or possibly at all – here treated to new software for faster shifting, together with a new all-wheel-drive system featuring a cooled diff on the front axle, and a limited slip diff at the rear. This new system, says Audi, is constantly variable (although mention is made of a standard 42:58 front-to-rear split), and can apportion up to 100 per cent of the car’s torque to either front or back, depending which end’s about to bury itself in the Armco. There’s a standard fit electro-mechanical steering – yes, gone is the old R8’s hydraulic set-up, and in comes an electric rack – with the option of variable steering. Passive dampers and steel suspension is the norm across both cars, with the option of Audi’s rather excellent adaptive magnetic dampers with three modes (Auto, Comfort, Dynamic). The, ahem, ‘base’ R8 features lightweight brakes, while the 610bhp V10 Plus gets even lighter ceramic brakes as standard. Wheels? 19-inchers are standard, 20s are an option, there are specially developed tyres (again with the option of semi-slicks if you like), and a new ‘Performance’ setting. It adjusts the car’s behaviour in different conditions, with three settings for wet, dry and snow. In snow, for example, the torque to the AWD system is limited, so you don’t end up spinning away unnecessarily. In dry, everything is set to full attack, with the ESC turned off as a default (though if the car judges your pedal/steering input to be wildly different and considers you in trouble, it’ll step in to save any expensive embarrassment). Think of ‘Performance’ as sitting above the drive select modes, if you can. Frank Stippler, DTM driver and Audi’s long-serving development driver, reckons this system is the perfect mix to satisfy the smooth, clean and faster drivers (with no ESC intervention), but flatter those who require a bit more help. So come on, what’s it like then? We were only allowed to ride shotgun while Frank Stippler nailed it around Ascari, but suffice to say, it’s effing quick. We sampled the higher powered 602bhp V10 Plus, and the acceleration was absolutely savage. This is one of the great naturally aspirated engines, all snarly, baritone aggression capped off by a howling top end. Lovely stuff. It also had the optional sports exhaust, which is an essential tick in the box for any prospective owner. What else can you ascertain from the passenger seat? Not much, other than the speed Stippler carried into corners was huge, the car didn’t struggle, it oversteers at will, and the steering appears to be pretty quick. But better let the man himself explain. Of course, Stippler works for Audi, so you wouldn’t expect him to be rude about his employer’s latest creation. Still, sounds promising, doesn’t it? Ah yes, the racetrack. How does it fare around the Nürburgring? Audi’s engineers were particularly coy when pushed on this, because of course, a ‘Ring time is hugely dependent on tyres, final engine and chassis setup and the bloody weather on the day. But Frank told TG that he reckons this new car is anywhere between 10 to 15 seconds faster than the old one. Yeah, exactly. Stippler also reckons that though the new R8 is slightly softer in setup than the Huracan, it’s no slower around the track. The new car, then, ought to manage that traditional R8 USP of being really fast on circuit, yet comfortable in town. The interior – though we can’t show you pictures just yet – is also cleaner, pinching the lovely full 3D digital dash of the TT, surrounded in the familiar R8 structure, but cleaner. And neater. The seats feel superb, there’s more boot space than before, it’s easy to get in and out of, there’s more headroom than the associated Huracan, and the steering wheel contains pretty much every button you’ll need. So should I ready my wallet?